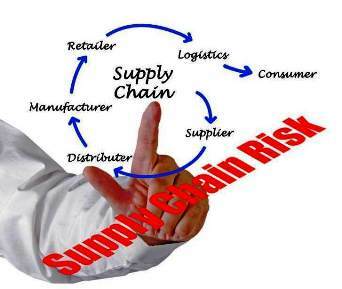 Nearly a quarter of respondents to a survey claimed their organization had suffered losses of at least €1m ($1.25m) during the previous 12 months (up from 15 percent last year) as a result of supply chain disruptions, according to a report from the Business Continuity Institute. Slightly more than 13 percent suffered a one-time disruption that cost in excess of €1m (up from 9 percent last year). The study also showed that 40 percent of respondents claimed their organization was not insured against any of these losses while 20 percent were only insured against half of these losses. 76 percent of respondents had experienced at least one supply chain disruption during the previous 12 months, yet a quarter of respondents (28 percent) still had no business continuity (BC) arrangements in place to deal with such an event. Supported by global insurer Zurich, the report concludes that supply chain disruptions are costly and may cause significant damage to an organisation’s reputation. While the survey results indicate a growing awareness of BC and its role in ensuring supply chain resilience, many organisations have yet to improve on their reporting and BC arrangements. While budgets for business continuity and ensuring supply chain resilience are often slashed in favour of other priorities, this study demonstrates why this often might not be a wise course of action. With the growing cost of disruption worldwide and the potential reputational damage caused as a result of failing to have appropriate transparency in the supply chain, investments in this area are essential and can spell the difference when disaster strikes. 78.6 percent of respondents do not have full visibility of their supply chains. Only 26.5 percent of organisations coordinate and report supply chain disruption enterprise-wide. Some 44.4 percent of disruptions originate below the Tier 1 supplier and 13 percent of organisations do not analyse their supply chains to identify the source of the disruption. The primary sources of disruption to supply chains in the last 12 months were unplanned IT and telecommunications outage (52.9 percent), adverse weather (51.6 percent) and outsourcer service failure (35.8 percent). The loss of productivity (58.5 percent) remains as the top consequence of supply chain disruptions for the sixth year running. Increased cost of working (47.5 percent) and loss of revenue (44.7 percent) are also more commonly reported this year and round out the top three. Respondents reporting low top management commitment to this issue have risen from 21.1 percent to 28.6 percent. This is a worrying finding as low commitment is likely to coincide with limited investment in this key performance area. The percentage of firms having BC arrangements in place against supply chain disruption has risen from 57.7 percent to 72.0 percent. However, segmenting the data reveals that small and medium-sized enterprises (SMEs) are less likely to have BC arrangements (63.9 percent) than large businesses (76.2 percent). Editorial note: Plenty of opportunities for the business information industry to provide efficient supply chain risk management services.